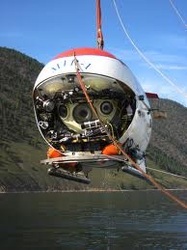 The Mir I and Mir II are battery-powered, three-person submersibles with a maximum operating depth of 6,000 m (20,000 ft). This deep-diving capability ranks the Mir vehicles among the deepest diving submersibles ever built, and gives them the capability to reach approximately 98% of the ocean floor. 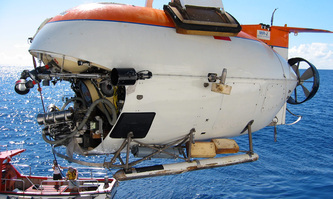 The Mirs allow scientists to observe the deep sea through multiple view ports, video records, instrument placement, sample collecting, and environmental monitoring. 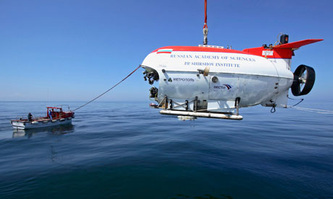 The submersibles are launched and recovered with a specialized crane from the starboard side of their primary support vessel the Research Vessel Akademik Mstislav Keldysh. The Keldysh has the advantage of having access to two deep-diving submersibles at the same time. 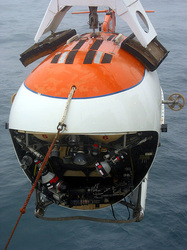 This allows one submersible to conduct science dives while the other remains in "ready" status in case of an emergency. For example, if the working sub were to get stuck at the bottom of the ocean or trapped in abandoned fishing nets, the second sub could be launched and rushed to the site, where it could work to free the first sub. Then too, some research projects benefit from the concurrent use of both submersibles. Indirect lighting of subjects, such as shipwrecks, is a special task best completed by the Mirs in tandem. 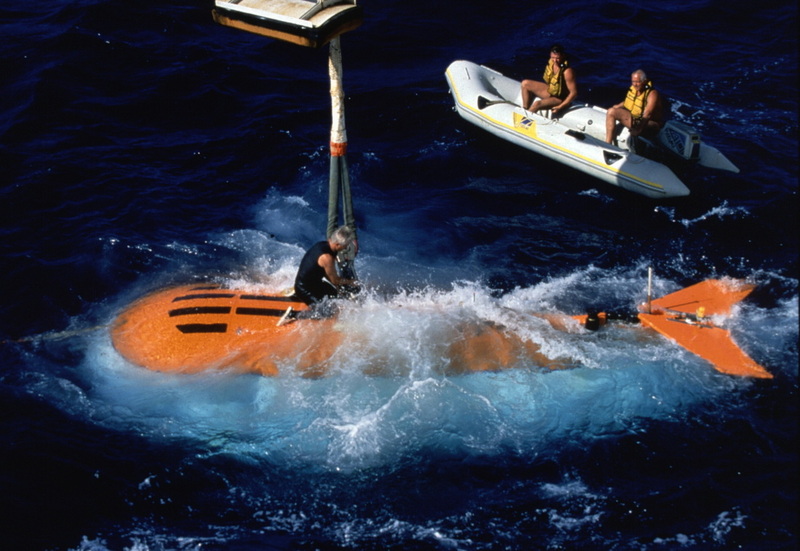 The Mir submersible is hoisted into the water via a cable connected to the ship’s winch system. This front view shows the versatile manipulator arms and the huge viewing port. Each submersible is 7.8 m long and weighs 18.6 tons. The personnel sphere of each sub is just over 2 m in diameter and is made of a 5-cm-thick combination of nickel and steel. The pilot and crew spend a long time in that small sphere, as the Mirs descend and ascend at the rather slow rate of 35-40 m/min. Reaching the full depth of 6,000 m can take more than 2 hrs! 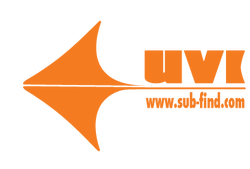 Once on the bottom, the Mirs can travel at up to 5 knots thanks to their large maneuverable propellers. Smaller steering propellers are located on each side. An adjustable ballast system allows the pilot to control the submersible’s buoyancy and hover over the bottom like an underwater helicopter. To observe the ocean, the crew can peer out of a huge viewing port. While looking out the window is great, the primary data that come from submersible dives are videos. Six 5,000-watt lights allow for excellent filmmaking. Scientists are not the only ones to employ the Mirs in underwater filming. Director James Cameron used them to make his blockbuster Titanic, and they have also been used for IMAX films. In addition to video capabilities, both submersibles have versatile manipulator arms. A skilled pilot can use the arms to collect biological and geological samples. The arms are also used for many other tasks. They include placing small temperature recorders into hydrothermal vents, and gently pushing the sub backward when the pilot wants to avoid stirring up sediments with the thrusters. In recent years, the Mir submersibles have continually been at the forefront of deep-ocean exploration. They have been used to survey and document submerged World War II vessels such as the German battleship Bismarck and Japanese submarine I-52, and the Russian nuclear submarines Kursk and Komsomolets. In 2007, the Mirs were part of an international expedition to reach the North Pole seafloor, and in 2008-2009 they were used extensively to study Lake Baikal, the world’s oldest and deepest body of fresh water. 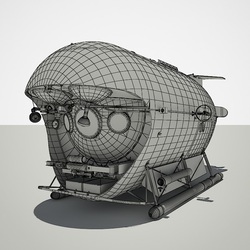 Just like the Russian space station with which they share their name, the marvelous Mirsubmersibles are valuable tools for exploring the unknown.